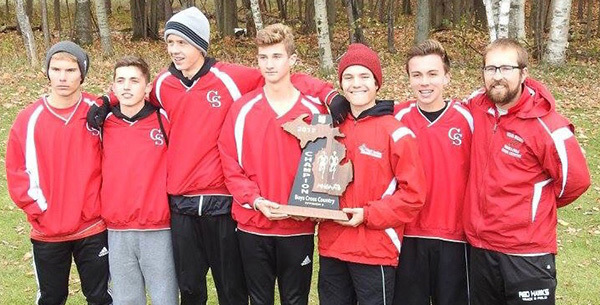 The Red Hawk boys cross country team is headed to state. Pictured (L to R): Jaydon Moleski, Gavin Braciak, Daniel Vermulm, Corey Bowers, Dallas Mora, Dilan Sargent, Coach Garrett Lacy (Austin Mann not pictured). It may have been an overcast, chilly day but that did not stop the Cedar Springs Boys Cross Country team from winning the Division II Regional Championship and upsetting the number three state ranked team of Fremont. The boys competed in the Division II MHSAA Regional competition at Michaywe Pines Golf Course in Gaylord on October 28 and clinched the championship, edging out Fremont with a score of 47 to 50. Each of the seven team members had impressive personal best times. Freshman Corey Bowers had a time of 16:28 (5th overall); senior Dallas Mora 16:29 (6th overall); sophomore Jaydon Moleski 16:44 (10th overall); sophomore Dilan Sargent 16:49.49 (12th overall); sophomore Gavin Braciak 16:49.71 (14th overall); sophomore Daniel Vermulm 17:31 (42nd overall); and freshman Austin Mann 18:28 (69th overall). It was a true team effort that paid off for the Red Hawks. Bowers, Mora, Moleski, Sargent, and Braciak each took home all-regional medals after placing in the top 15. The Red Hawks have had an exciting season. They brought home trophies from the Sparta Invitational (first); Red Hawk Invite (first); Carson City Invitational (second); and the Kent/Ottawa County Championship (first). Highlights also include the team winning the last OK White conference meet by outrunning Forest Hills Northern with a score of 43 to 47. Bowers, Mora, and Moleski each earned first team all-conference honors with Sargent also earning honorable mention all-conference honors. The boys travel to Michigan International Speedway in Brooklyn on Saturday, November 4, for state finals. Good luck to them! #LetsGoRedHawks.